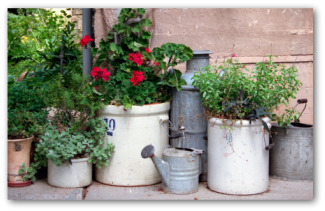 Great container garden pictures to inspire your own gardening plans. 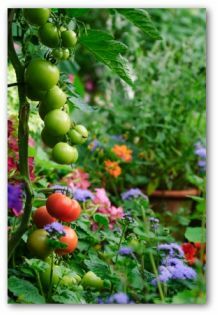 Whether planning a container garden on your patio, deck, porch or in the yard, these container gardening photos will give you lots of great ideas. This section is dedicated to those savvy gardeners who have decided to forgo battling the elements, plant diseases, pesky insects, and waging an uphill war with the weeds. 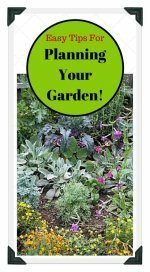 Instead they choose to settle in with a tall glass of lemonade and the latest seed catalog and try their hand at growing a container garden this season! 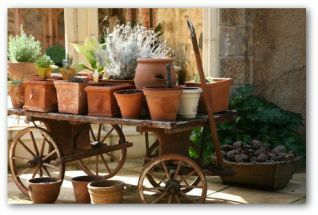 We salute you and plan to set you off on the right track with some amazing container garden pictures for inspiration. Planning a container garden is a lot of fun especially when you take a look at the container garden ideas we have in store for you. First up are instructions on how to make an herb and vegetable combination window box. Cut the garbage bag to fit the interior of the window box. Line the planter with a plastic bag. Secure the bag liner with staples. Drill small drainage holes in the bottom of the container. Fill the box 2/3 full with potting soil. Add time release fertilizer (if it's not already included in the soil you purchase). Evenly space the tallest plants along the back of the container garden. Plant the shorter plants along the sides and toward the front of the box. Firmly press in more soil between the plants. 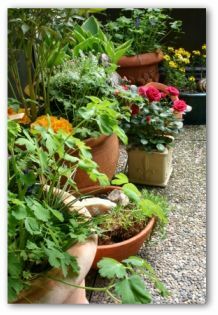 Water the container garden and situate it in a location that will receive full exposure from the sun. The plants will require watering daily. If required, use nontoxic forms of pest control. There is no one on earth quite like our Moms! Whether your Mom has a green thumb or is all thumbs, she is sure to be excited to receive a special gift of a Mother's Day container garden. Your mother, grandmother, or any nurturing female in your life can enjoy this present and eat it too! 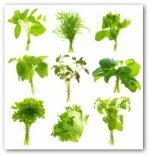 Mother's favorite vegetable or vegetables if you want to plant a variety. Soak the terra cotta pot in water. Soaking keeps the pot from absorbing water from the soil and drying out the plants' roots. Keep the container completely submerged until it is saturated. Use a small piece of window screen to cover the drainage holes in the bottom of the container, so when the water drains the soil remains in the pot. Fill the container 2/3 of the way full with the soilless container mixture. If the potting soil contains time release fertilizer, you are set to plant. Otherwise, mix fertilizer into the soil. Remove the Mother's Day plants from their plastic nursery containers and place them in the gift planter. Arrange the plants as you desire them to be planted. As necessary, take away or add potting soil. 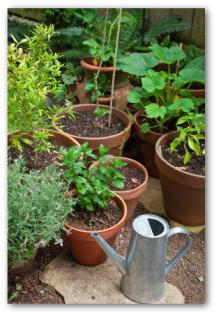 The plants and soil should sit about 1 inch below the top of the pot. This gives the water a place to pool instead of running over the sides of the container. Firmly press the soil in around the plants. Now don't forget to take a picture, so we can add it to our growing container garden pictures! 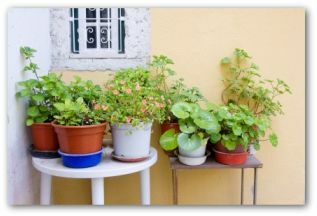 Build a vertical container garden on a sunny wall along your porch, patio, or balcony. 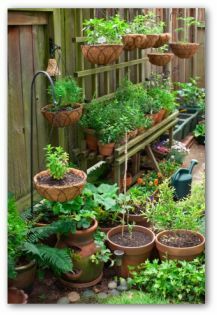 You might want to add some shelves to hold smaller pots, some hooks to hold hanging baskets, and a small table to give extra gardening surfaces or layers. 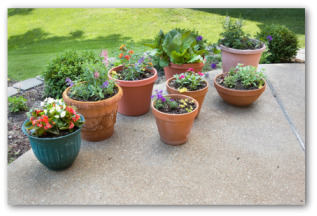 Having a sunny patio can be a godsend when planning a container garden. 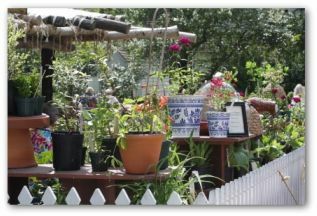 The great part of designing a container garden is that you can truly be as creative as you want to be. You can recycle containers already on hand, or purchase colorful plastic or ceramic, or stately cement or glazed containers as desired. Don't forget that old wheelbarrow, barrel, or washtub gathering dust in your garage. 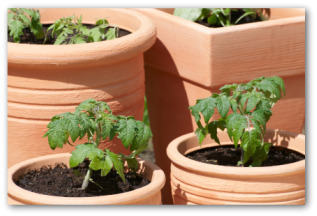 Check out garage sales for inexpensive potential garden containers.